Can you add dynamic sandwiches like in the furniture mod. Cause it feels weird not being able to have something I want on my sandwich. I'll add modular sandwiches to the list of things to do for the future update. I don't like the idea of being able to put whatever you want on a sandwich, you would end up with things like a seaweed, garlic and onion sandwich. 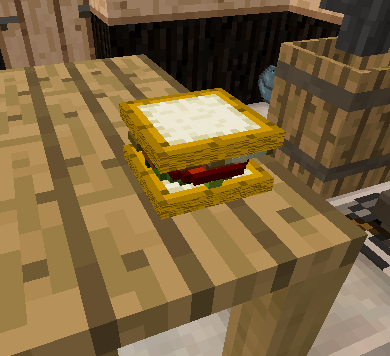 Could you provide a link to the wiki or description for the sandwiches in the furniture mod? 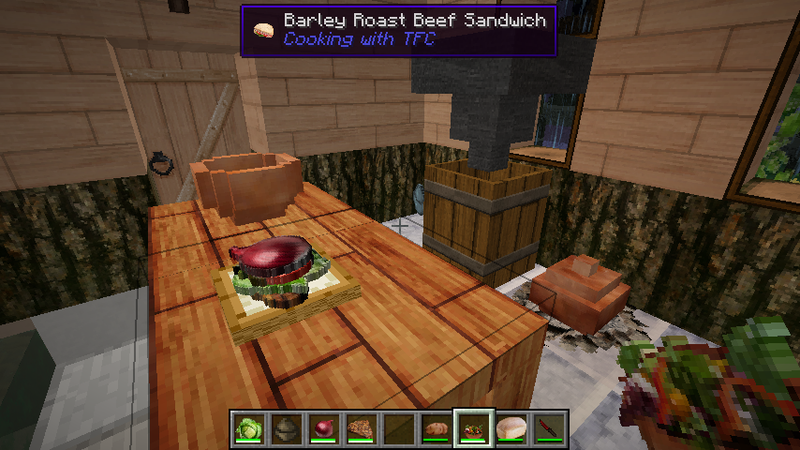 I will not allow conversion from CookingWithTFC food to TFC food since you could bypass the mod hunger system. I will talk with Powerman913717 to see if I can get his source code to add intermod compatibility but for whatever reason he has chosen to keep his mod closed source so I it is up to him. In addition, I will probably be adding juices that quench hunger and thirst in a future update. Btw it was the kitchen mod not the furniture mod apparently. Of course there would have to be some changes. Oh and could you do more stuff with milk. Like I don't know... add the ability to drink it and gain dairy. Cause in TFC you can only make cheese. I definitely think I could do something like the modular sandwich and a drinkable milk jug could also be a possibility. Oh and if it is not to much, do you you think you you could have a feature that is similar to Pam's Harvest Craft in which apples are rendered on trees and you can pick them? The issue with adults turning into babies might actually be an issue with the modpack I'm using (TechNodeFirmaCraft). I chose 96 days per year from the mod list, but I'm somehow on the 12th of June. Turns out something had set the year length to 360 in my configs. I actually prefer the way TFC fruit trees have the fruit obscured in the leaves. I'm not really to the point of considering condiments and I'm not really sure I want to go as far as condiments. One issue I constantly have to consider is how realistic I want to be in making foods. I am opting to take a simplified approach to cooking compared to the actually recipes, otherwise there would be thousands of new items and ingredients for making food and it would become too much of a task to eat. So I am tending to condense recipes down to a few ingredients and leaving out the minor ingredients, which might mean condiments will never be needed. It's strange, but I can drink milk in TFC by right-clicking with milk bucket in hand. You just have to be hungry and thirsty, to be able to drink milk. Try to right-click in air, not on block. Thanks, I've even seen this in the code many times but I keep forgetting that I've checked it and I look it up in the code yet another time. lol. I was waiting for that feature. OMG ! This is really nice! But does this work with a texture pack? Also does this add-on conflict with the spice of life mod? Well, the sandwich will look like it does as show above. I am fairly certain the Spice of Life, like every other vanilla food/hunger mod, does not work with TFC considering TFC has its own hunger system separate from the vanilla system. Oh okay but I mean that I use a tic texture pack that changed the texture of foods like an Apple for instance. So will it show with that specific texture? Yep, it will use whatever texture is defined in the texture pack. In fact, since I use textures from TFC whenever I can, there are quite a few things that are supported by multiple texture packs. I will explain more when I am actually done making it and posted the update. As you can see, the prep table, food items, clay items and blocks all have textures from Nyssa's. Also, this is a sandwich without the top slice of bread. I am currently finishing up with salads and I will be posting this update after that. So as you can see, this addon already has a lot of support with texture packs. Could you please make your food prep tables accept also all non-food items to be placed in the gui? So they could be used as normal tables and would render all items you put on these tables.